You know, I have to say... 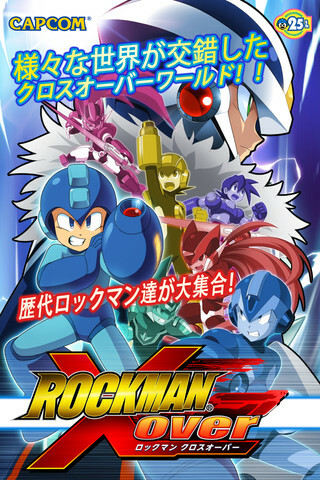 I think I completely forgot about Rockman Xover until just now. Here's hoping it's as awesome as I think it is (based on the Cutstuff demo)! I seem to have no fucks to give. And what, exactly, are these "Crests"? 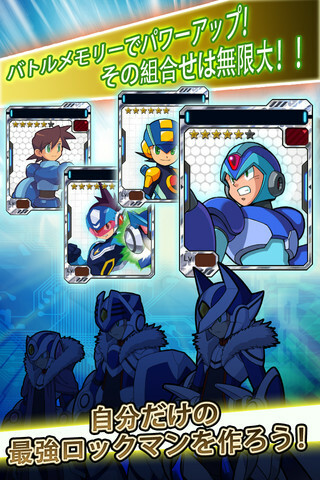 Are they those cards that enhance your abilities and feature lazily recycled artwork from past Megaman games? Now we can finally find out about the bosses and if there's anything that isn't recycled from the X1 iOS release. If the memory chips (which gives Crests?) are the full extent of the jam, then what am I fighting foooooooooooooooor? Well we had a good run as a franchise. I too nearly forgot about Xover until this news announcement. Also, everyone should be happy, because it's Xover and asdfghjkl; OVER-1 is adorbs. Also laughing at 1:13AM Anon who thinks the franchise is doomed, go back to supporting the uncancellation of MML3 please. See this? This is me not giving a damn. Call me when a REAL Megaman game gets made, if Hell doesn't freeze over first. Cue Zerker telling everyone to shut up and enjoy this piece of garbage. Still though, this is the final release. Is there anything new that we didn't know about before, or is it just the same trash as always? The extended version of the Trailer song is pretty nice. They have this EP system where going to dungeons cost EP and you gain 1 every five minutes (or if you buy them from the store with yen). Prevents you from power leveling. I can't seem to find the Auto button. Did they take it out? It's okay I guess. I don't fully understand the entire system yet, but as games that require energy go, its a little more involved than most. Feel's like it should have been on facebook, honestly. The MMX iOS game is better, I think. I will reserve judgement until I play the English version and have more of an idea of what the cards do in various circumstances. Wait, is the MegaMan.EXE and Star Force Mega Man rated higher than X and Volnutt? Ho Ho, interesting. Interesting indeed. As of the time of my reading, it's got 21 reviews and a 4.5 score. Is that for real? I'll just save my money and put it towards something else. You guys shouldn't buy it either. It wasn't cancelled? I'm surprised. Say, only over-1 is playable? With the chips allowing him to act like other Mega Men in a similar way to Emerl from Sonic Battle? If that doesn't speak to the general atmosphere of response to this game, and therefore its quality, I don't know what does. It finally arrives, I have been waiting to actually give it a chance, and it's jap only?? Also, you probably haven't even played the damn game. There is bound to be more bosses from outside the X series. This.. This is an embarrassment. No, it's a slap in the face. A slap with a dirty, moldy, smelly fish! They decide to cancel two Mega Man games, and instead... They give us this for the 25th Anniversy. Seriously? FANGAMES are made better then this crap. Capcom is pretty much a waste now. If it wasn't for Pheonix Wright and Dragon's Dogma, I would not even care about them. This is just sad.. Why can't Capcom make games anymore? How about something different, interesting and good? Hell, how about something just interesting and good? The thing I believe to be the metagame is interesting, I give you that. The cards premise is actually nice, given how it was and can be executed and marketed (more cards through promos and give-aways). But the gameplay is very lazily done and executed. No input that is worth your effort, which is a staple, nay, a rule of thumb in all Rockman games. It tries a different (and stupidly simplified) approach at the Jump-N-Shoot formula, but it strips it of any kind of actual platforming and turns it into a monotonous 2D railshooter that requires very little effort or practice to revisit whatsoever. Let's give this the benefit of doubt: it's a mobile game, no need to be super complex (Intuition! Rockman). But a lot of mobile games have proved that a game can be based on a single and simplified gameplay and still be attractive and enjoyable. Rockman games were already that. This is just further simplifying an already simple, easy to pick up and play game. 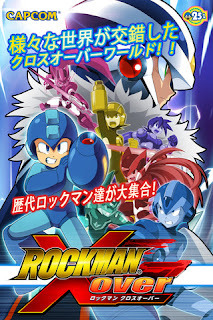 By today's standards, Rockman 1 would've been a successful mobile game if it released today. I might understand how this is a more financially viable game than say, another Classic Rockman game on the Wii or any other consoles. But the product overall is just so absurdly lazy it's a travesty of a Rockman game. By itself, it doesn't hold up to its franchise's name, and any of its games. I'm nominally satisfied to finally see a new Rockman game out of development and into the market. But this hardly embodies what Rockman games are about. It even looks like a mockery of them (JUMPANDSHOOTMAN FIGHTS ROBOTS WITH REHASHED THEMES AND GETS DIFFERENT WEAPONS). I can't support this. It would be going against my love and appreciation of what makes Rockman games good. There is way more cooler Rockman merchandise than this that I can spend my non-existant money on. In the meantime, I'll be expecting megacocorock's Roll-Chan. @kobun37: Not to sound like a conspiracy nut, but I wouldn't be TOO surprised if a good chunk of those reviews are done by Capcom people or people paid by Capcom to 5-star it. Just sayin'. Anyone find it funny that it has 4+ out of 5 stars for ratings? So I downloaded this piece of trash last night and my internet went out so it wouldn't let me play. Disabled WiFi and continued. Then it asks me to make an ID or something with 8 characters. Had no luck no matter what I tried. I guess the game is so bad that it's telling me not to play it lol. The video of the Flutter scene appears in the actual game. After collecting 9 Map Parts and going to the Bonus Boss menu, it shows this video before transitioning to the boss fight. Basically, OVER-1 and Kalinka use the Flutter to traverse the world(s) using the Map Data to fight the Bonus bosses. It's not a hidden video file in the game's data of Capcom going "screw you". I'll post up my impressions of the game in my next comment. >Customization with Battle Chip memory seems like it might be pretty complex and deep. Definitely has a lot of potential, if fleshed out a little bit more. >As everyone had feared, main gameplay is extremely simple. >Stiff and somewhat glitchy menu transitions, feels really cheaply done, especially for iOS. >Very simplified animations, OVER-1's running animation doesn't even go past 7 frames and looks choppy. >When equipping Battle Memory, does not allow you to see specific stats until after it's already equipped. Overall, I'd give it, at the moment, a 5 out of 10. Not what I was hoping for the big 25th Anniversary, but at least it's SOMETHING. Okay, there are actually people, in the universe, who still believes that this piece of garbage has a chance to be good? And actually want to try it? Despite everything shown that this "game" is one of the biggest wastes of human talent and datastorage on the internet in human history? Don't read too much into it coming out in Japan first. Sven stated awhile back it's coming out here. They might have changed their minds, but I doubt it. You had one job, Capcom. I said on TMMN that Xover was apathy in video game form, and I stand by that statement. What, Xover's been released today? Ooh, for real? Aren't I just brimming with excitement. Like I said before, even Universe was better than this piece of garbage, and that's saying a lot. Hey, Protodude. What happened to the article about the Legends movie in XOver's files? Okay, as much as I hate this trash that Capcom has the gall to release for the 25th anniversary, I am curious... what is the Japanese market's opinion on this game? I know a lot of us here in the west hate it, but I am curious what those in Japan think. They have a bigger appreciation for games on the iphone, so I am just wondering if it will do well in their neck of the woods. I am not saying I would like them to import it if it is successful as I wouldn't waste money on this from what I have seen (and it's not pretty). I am just curious. @ZeroX_Syaoran: We jumped the gun. It's actually in the game when you complete a map. @Castillero: There was actually an article on TMMN addressing that. The Japanese fans were not impressed with Xover, to say the least, and I'd say they're still not impressed. Well...it's free. Might as well try it out. That seems implausible since the game only allows you to do so much each day without purchasing more time as it were. It's why no one has really made much progress yet since they ran out and didn't even get out of the first set of stages. So the game's terrible? What a shocker. Wow. You guys are really ungrateful aren't you? At least there IS a Mega Man game this year. Such a great concept, such terrible execution. Honestly if it weren't for Capcom's current relationship to its fans right now, I could see a little of where they were going with this. I mean, a game where you can collect references to every Rockman series possible? I'm not being sarcastic; collecting that kind of stuff is pretty fun for some of us, and it makes sense as a 25th anniversary game. Now if only there was more effort, a different platform, and less overall stupidity in this game...really, turn-based boss battles? Does anyone have a link to the infamous Flutter video. @Protodude: Wait, so that movie was inside the gameplay itself? Does anyone happen to have all the links or ID codes of the promo cards? One dude OmegaMan at TMMN said that "I heard a conspiracy theory that Capcom was releasing this game intentionally bad just to give an excuse to blame the fans’ bashings for the death of the Mega Man franchise." After reading that comment beside all the other comments and seeing how the game turned out I'm very... confused. Capcom, what has happened. Is this kind of game quality intentional or what? I still can't get over the feather boa. It's so bad, it's hilarious. A FEATHER BOA, PEOPLE. A FIGHTING ROBOT WITH A FEATHER BOA. @Zerker: I get your mentality of "at least is something", but some people prefer nothing over crap. Kind of like "If you're not gonna do it right, don't do it at all". @Zerker: So what? Should one person be pleased that he got his favorite food for dinner after not eating it for months even if it was poorly prepared and baked for 5 seconds? Ohhh, Rockman game! Time to get an iPhone for it! Except, you know, that would require about as much money as what went into the making of this. Not even close to half of us. Even if we did want Xover (which we don't; crap with Rock's face on it is still crap), barely any of us got the game we were looking forward to after it was announced. I know you won't read this, (it's boring and tl;dr), but stop telling us to be thankful for a pile of crap. You can enjoy it all you want, but we're allowed to be disgusted at something you like. Being honest, the gameplay mechanics were crap, the programmers made crap. But I hope, I REALLY HOPE (...oh god why...) that this game will have at least an entertaining story full of fanservice. You CAN do that in a couple of months, so, maybe this game have some surprises...or I'm a completely fool for keep believing a bit in Capcom. @ 9:09AM Anon - Consider this for a second: Pluto from the Game Boy Mega Man games is covered in fur, yet you're not going 'omffackinggod spaece robit wearing furrz how pathetic'. @ 9:43AM Anon - Some does not make up the majority. @ TAG - It's awful to know that it's nearly 2000andfucking13 and people still use :3 and xD as emotes. On another note (avoiding the people who are still bashing Xover because boohoo it isn't Universe or MML3 and OVER-1 wears a fur collar), does anyone know if there are any bosses from outside of the X series in the game? I am really curious to know because reasons. Wow, Krazy Monkey saying somethings worse then Universe. That's kinda embarassing, Capcom. Zerker, you throw around so many ad hominems in your arguments, it's absolutely pathetic. Here everyone is, pointing out legitimate flaws and making valid criticisms of the game, and all you can do is spout that same repetitive "OMG UR JUST SAYING THAT CUZ IT'S NOT LEGENDS 3 AND UNIVERSE" crap. I'm pretty sure I've already told you this before, but you don't have to be fan of either of those games to see that Xover is an abomination. At this point, I'm almost certain that you truly are a troll, as quite a few people have been saying. It's either that, or you just flat-out don't know how to read, plain and simple. lol Cheap exploit! If you spend 10EP to fight a boss and you feel like you're going to lose, just exit out of the app and relaunch RockMan Xover. Your 10EP won't be spent and you can use it on something else than wasting it on a lost boss fight. This can also be done if you're looking for Map Parts in stages and don't find any. Are there only 4 worlds? Yeah, they have all the X1 bosses. World 3 is based off Mega Man 1 and World 4 is based off BN. BTW, the secret boss for World 3 is Dr. Wily. I have no possible way of beating any of the BN bosses. Toolow leveled. I assume it won't stay that way long. Capcom updates their free to play mobile games with new content pretty regularly. That's the way F2P games work. New stuff keeps people coming back and spending money. If they let the game stagnate, people stop buying. Oh man - this garbage actually made it onto iOS? 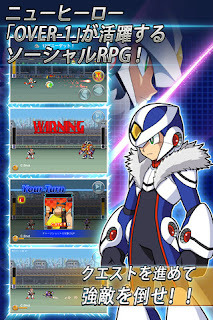 Seriously, if you're any fan of Mega Man/Rockman, you would not support this game in any way. This is nothing but a bastardization of the Mega Man name. If you think it looks good, you should feel bad. Isn't it obvious that the reason there are two X worlds is to reuse the content from the iOS MMX? D-REX, RT55-J and Giant Metall appear in screenshots. They only appear in the multiplayer mode? Also, Utuboros and Bospider appear in the game?